Keep all electrical appliances and cords away from water. Keep all pot handles on the stove turned towards the back of the range top. Same is true for pots sitting on counters – make sure pot handles are turned back. 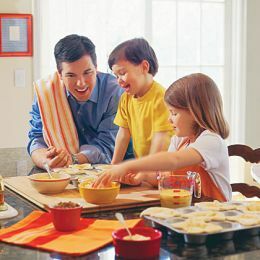 Keep sharp knives out of the reach of young children. Keep paper towels, dish towels and packaging away from hot burners. Use oven mitts when removing hot dishes from the oven. Place a hot dish in a secure place away from the reach of younger children. Surround the hot dish with pot holders or dish towels to prevent burns. Metal and microwaves don’t mix. Use only glass or other microwave-safe containers in the microwave oven. Never use aluminum foil in a microwave oven. Food and dishes in microwaves get very hot from steam, use oven mitts! Watch that you don’t get burned by the steam! Always pierce potatoes with a fork or knife in several spots before microwaving. Beware of long sleeves or other loose clothing that can ignite from a burner or fall into hot grease or boiling water. Don’t leave food on the stove unattended. Unwatched pots can spill, boil over, burn, etc. Unwatched fat or oil in a frying pan can burn and may start a house fire. Clean up spills immediately – wet floors are a hazard. Wash hands thoroughly in warm, soapy water before starting a project, as well as before and after handling food, especially raw meats. Use separate cutting boards for vegetables and raw meats. Keep counter surfaces clean and sanitized, especially if raw meats have been handled. Immediately wash and sanitize any surface where raw meats and poultry have touched to prevent cross-contamination. Refrigerate unused food portions immediately.